Reducing poverty has become an international concern, yet there is no international consensus on guidelines for measuring poverty. In pure economic terms, income poverty is when a family's income fails to meet a federally established threshold that differs across countries. Typically it is measured with respect to families and not the individual, and is adjusted for the number of persons in a family. Economists often seek to identify the families whose economic position (defined as command over resources) falls below some minimally acceptance level. Similarly, the international standard of extreme poverty is set to the possession of less than 1.9$ a day. Frequently, poverty is defined in either relative or absolute terms. Absolute poverty measures poverty in relation to the amount of money necessary to meet basic needs such as food, clothing, and shelter. The concept of absolute poverty is not concerned with broader quality of life issues or with the overall level of inequality in society. The concept therefore fails to recognize that individuals have important social and cultural needs. This, and similar criticisms, led to the development of the concept of relative poverty. Relative poverty defines poverty in relation to the economic status of other members of the society: people are poor if they fall below prevailing standards of living in a given societal context. An important criticism of both concepts is that they are largely concerned with income and consumption. The concept of social exclusion emerged largely in reaction to this type of narrow definition of poverty. It has contributed significantly towards including multi-faceted indicators of ill-being into the conceptual understanding of poverty. To further develop the definition of the concept of relative poverty or relative deprivation, three perspectives are relevant; the income perspective indicates that a person is poor only if his or her income is below the country's poverty line (defined in terms of having income sufficient for a specified amount of food); the basic needs perspective goes beyond the income perspective to include the need for the provision by a community of the basic social services necessary to prevent individuals from falling into poverty; and finally, the capability (or empowerment) perspective suggests that poverty signify a lack of some basic capability to function. What is the difference between ‘relative poverty’ and ‘absolute poverty’? What is meant by the term ‘poverty line’ (or ‘poverty threshold’)? 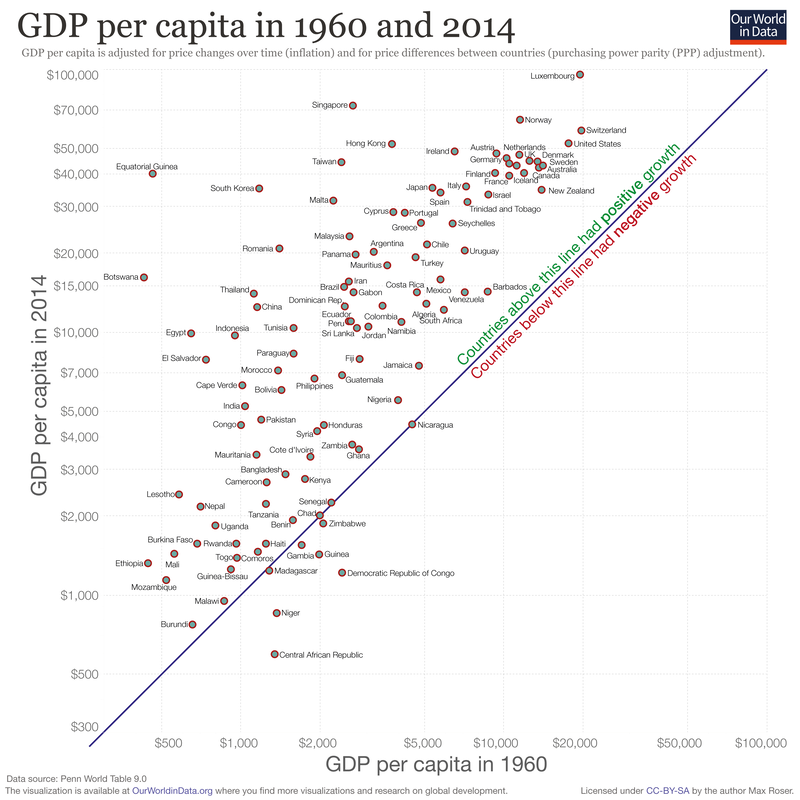 Why is the somewhat arbitrary figure of US$1.90 used as the extreme poverty threshold? Quoting figures, describe the world-wide trend in poverty since 1981. Which group of countries had (a) the highest poverty levels in 2013, (b) the lowest poverty levels in 2013, (c) the biggest reduction in poverty levels between 1987 and 2013, and (d) the smallest percentage reduction in poverty between 1981 and 2013? Describe the differences in the poverty trends in the four regions shown by dashed lines. Suggest reasons for the differences. 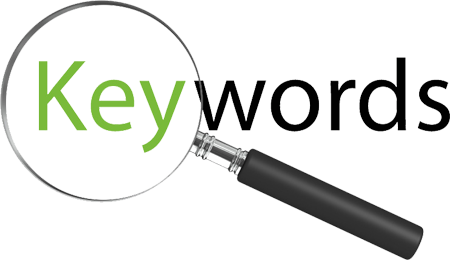 What is causing world-wide poverty levels to decrease? 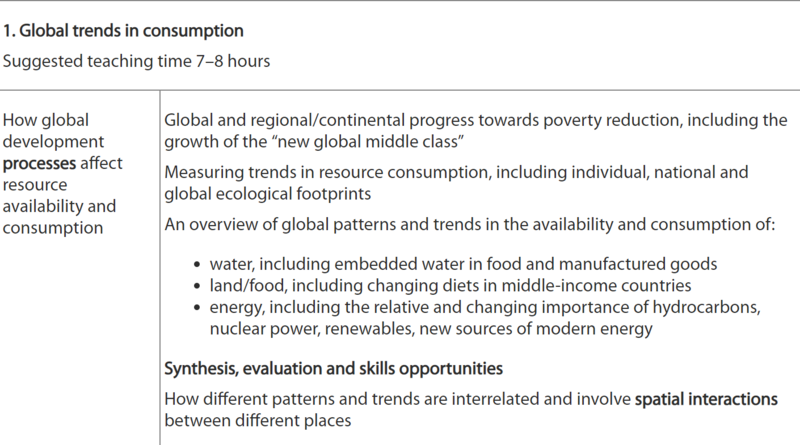 Using figures where possible, describe the growth of the global middle class. ​Overshoot, which in this context is shorthand for ecological overshoot, occurs when a population’s demand on an ecosystem exceeds the capacity of that ecosystem to regenerate the resources it consumes and to absorb its carbon dioxide emissions. The Ecological Footprint is often used to calculate global ecological overshoot, which occurs when humanity’s demand on the biosphere exceeds the available biological capacity of the planet. By definition, overshoot leads to a depletion of the planet’s life supporting biological capital and/or to an accumulation of carbon dioxide emissions. Ecological footprint = the theoretical measurement of the amount of land and water a population requires to produce the resources it consumes and to absorb its waste, under prevailing technology. How is the Ecological Footprint calculated? Arable Land Required: the amount of land required for growing crops for food, fiber, animal feed etc. Pasture Land Required: the resources required for growing animals for meat, hides, milk etc. 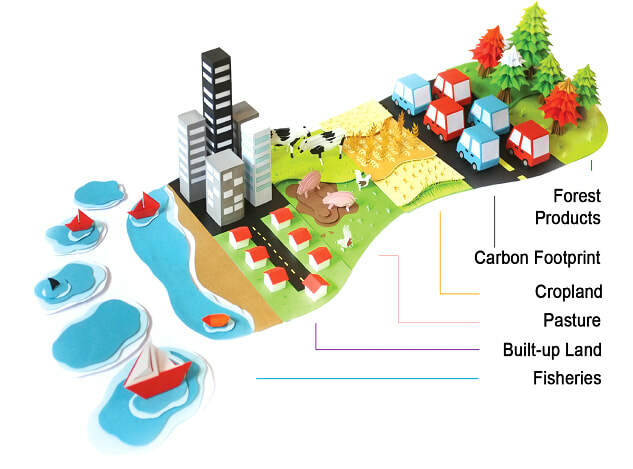 Forest Resources: the resources needed for fuel, furniture, housing, etc and for providing many ecosystem service like climate stability and erosion prevention. Infrastructure Needed: land needed for transportation and building factories, housing etc. Energy Costs: land required for absorbing carbon dioxide emissions and other wastes. The planet's biological productive capacity (biocapacity) is approximately 1.9 hectares (4.7 acres) per person. Globally, we use up to 2.2 hectares per person. ​Global Hectare: The measurement of biocapacity and ecological footprint. There were 13.4billion hectares of biologically productive land and water on this planet in 2005. Dividing by the number of people alive in that year, 6.5 billion, gives 2.1 global hectares per person. Ecological Debitor: Country's whole ecological footprint is higher than their biocapacity. Ecological Creditor: Country's whose ecological footprint is lower than their biocapacity. Biocapacity - is the capacity of an area to provide resources and absorb wastes. When the area's ecological footprint exceeds its biocapacity, an ecological deficit occurs. What is meant by the terms ‘biocapacity’, ‘ecological footprint’ and ‘global hectares’? ​Explain why it is claimed the Earth has a biocapacity deficit. Describe and account for the differences in biocapacity using the interactive link. Water availability, defined as the annual long-term average renewable water resource derived from natural discharge including consumptive water use, shows a large spatial variation among river basins. Annual water availability ranges from >1000 mm year−1 (western Norway, Britain's west coast, southern Iceland) to <100 mm year−1 (parts of Spain, Sicily, large parts of the Ukraine, Southern Russia, large parts of Turkey). In most of Europe this reflects patterns of precipitation, whereas available water is transferred by rivers into more dry regions in other parts. Hungary, for example, attains most of its water from outside the country via the Danube and Tisza. Water availability plays a crucial role for the development of a country. It grants human livelihood, the preservation of the ecosystem, and it is a primary input for every economic activity. The water scarcity that characterize the area is especially due to the great imbalance between the water supply and demand given by the steady increase in population, but also because of the growing environmental degradation and the water sector mismanagement. The projected population growth is expected to reach its peak by mid-century, while the forecasted climatic changes are expected to cause, already in the next decades, a further decrease in rainfall and an increase in extremes weather episodes and soil degradation. All these aspects will contribute to further decrease the water availability for each country, creating a higher competition among all the different users. In this regards, there will be a dual effect: inside each country, there will be more competition among the different economic sectors, while outside of the national border, we will assist to an intensification of disputes over the shared water resources. Indeed, one other important aspect of the water resources in this area, is that many of them are trans boundary. Many of the regional surface freshwater resources such as streams, lakes or river basins, and shallow and deep aquifer systems, are shared by two or more countries. Their management clearly require a careful approach toward cooperation and planning for balancing the countries’ water demand and the sustainable development of the shared resource. The current increasing depletion and the consequent quality degradation of these resources can originate or exacerbate inter- or intra-national conflicts. For what concerns the natural water resources in the area, their scarcity is not just an issue from a quantitative perspective that is, lack of water access, but it impacts also its quality, with an alarming degradation due to municipal, industrial pollution and salinity that have critical consequences for the human health. Groundwater over abstraction causes a decline in the aquifer levels, which not only increases costs for water pumping, but it is also directly linked with the degradation of the water quality due to higher concentration of natural and man-made contaminants in the remaining reserve. Uncontrolled agricultural practices and the abuse of fertilizers can strongly affect the quality of the rivers and streams, damaging the soil, and the ecosystems. Furthermore, the desalination brine disposal into the sea, industrial pollution, and untreated wastewater discharge can also degrade marine and coastal ecosystems. When trying to analyze the connection between water availability and human health, we need to focus our attention on the water required for drinking and sanitation purposes. The baseline or absolute minimum requirement for humans in general is the one granting their survival. In relative terms, some studies have elaborated benchmark values for daily drinking water consumption and these are strongly correlated with the climatic zone. The National Research Council of the National Academy of Sciences in the United States estimated the basic human requirements in association with the energy content of food intake. They assume three liters of water per day for average climatic conditions, while there is a linear increase when the harshness of environment increases. In hot and dry climates, a good approximation would be to increase up to 5 L per individual per day. ​When we shift our attention on the basic requirements for sanitation, the relations between clean and adequate sanitation services and improved health is clear and direct. Linked with water for sanitation, there is the water needed for basic personal hygiene, which lower the risk of diseases. Unfortunately, particularly in middle-low income countries, the access to clean drinking water and methods for disposal of human wastes remain underdeveloped and the main reason is mainly the lack of financial and institutional capability to take action. The last component of water requirements comprise the water needed for food production and processing. Developing countries would need major improvements in agricultural technology to save water and on the other hand, at domestic level, more systematic surveys should be undertaken in order to manage water waste. 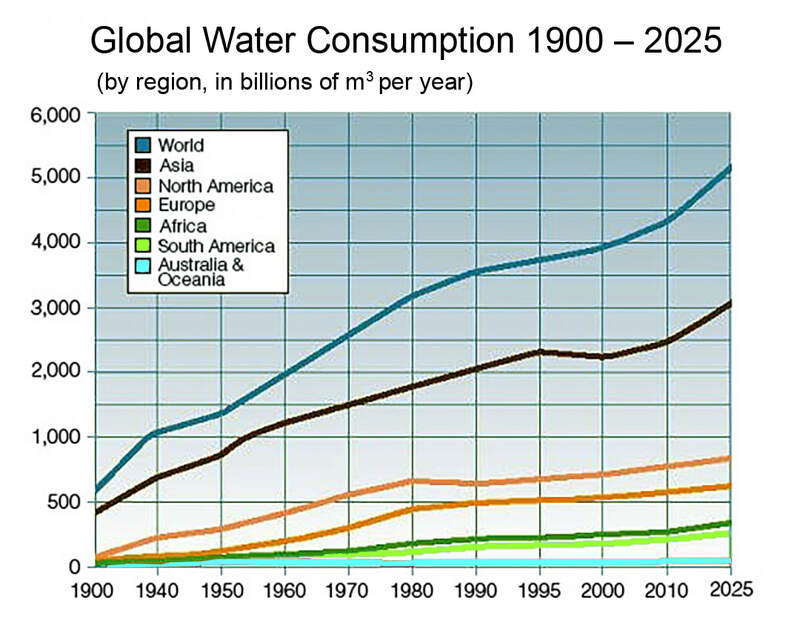 Despite being constantly replenished by the water cycle, accelerated population growth in recent times is dramatically increasing water demand, which as a result is putting excessive pressure on global fresh water supply. We know we need to stop wasting water by using things like water butts and turning off the tap while we brush our teeth, but what about all the water use to make things we eat and use – that never seems to be considered. There is obviously the water we use on a daily basis for drinking and washing and flushing away waste which equates to about 150 litres per day. This is the publicised number you may hear about, but sadly this only tells half the story. When a product gets made, normally there is an enormous amount of water used to produce it. This is known as the embedded water (or virtual water); for example to produce 1kg of beef it actually requires about 15,400 litres of water, when you take into account that you need to grow the crops to feed the cow, the cow needs to drink, and it will also be eating roughages such as grass (which needs water to grow). Unfortunately, pretty much every item we use needs an incredible volume of water to produce it. In fact, if we took into account the embedded water we ‘use’ on a daily basis, the UK average use per day goes up from 150 litres per day to 3,400 litres (a 2300% increase). This 3,250 litres of additional water is made up of about 70% from food production and about 30% from industrial goods. The water embedded in a product can be further categorised into green, blue and grey water. Green water is soil water derived directly from rainfall, so can be considered free and its use unproblematic, since it is most often used directly where it falls. Blue water includes both surface and ground water (such as a lake or a river), which can be used for irrigation or by the water companies to meet the needs of the general population. On the whole blue water can be considered sustainable, since it is hoped rivers will keep flowing as rain falls on catchment areas, however if more water is removed that enters the systems in the first place then problems will be encountered. This can be especially true on longer rivers, where the catchment is focused on the start of the river (for example if it starts in a mountainous region). Grey water is the water that becomes polluted as a result of producing goods, which can be further broken down into two sorts. Firstly you get the waste water directly from producing products, but also grey water consists of the freshwater required to dilute the polluted water to allow it to be discharged into the natural water system. For example taking the 1kg of beef example, of the 15,400 litres of water used to produce it, 94% of this can be considered green water, 4% blue and the remainder grey water. Sadly for meat lovers, all meat products have a higher embedded water quantity. It is estimated that to produce 1kg of beef, 15,400 litres of water are required while only(!!) 1,000 litres of water is used to produce 1kg of wheat. Beef is one of the worst offenders though; sheep (including lamb) uses about 10,400 litres to produce one kg, pork has an average global water footprint of 5,990 litres per kg and chicken comes out best at 5,500 litres per kg. Cereal grains account for about 60% of global food production, of which wheat, maize and rice account for about 75% of that total. Paddy rice requires about 1,670 litres of water to produce per kilogram, but to get this into the refined form that we are used to actually means that the embedded water in a kilogram of white rice is more like 2,500 litres per kilogram. The average water to create one kilogram of maize is 1,220 litres, however this varies considerably depending where it is produced, for example in the USA it is only 760 litres per kg, while in India it is more than three times as much at 2,540 litres of water to produce a kg. Wheat takes about 1,827 litres of water to produce a kg. A pair of jeans contains 10,850 litres of embedded water. A car contains between 500,000 and 1,000,000 litres of embedded water. 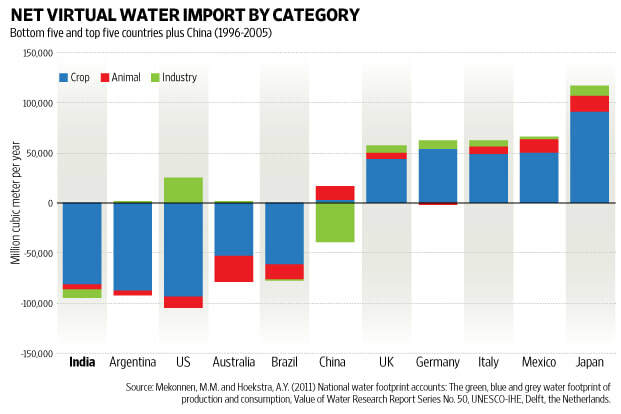 The availability and consumption of water resources varies in quantity in different parts of the world. When people living in an area cannot obtain enough water resources to meet their needs, we say there is a situation of water scarcity. Water scarcity is not the same as a low annual rainfall. Water scarcity is a measure of resource availability; it describes the relationship between the available water resources in an area and the water needs of the population living there. There are many arid areas of the world that receive very little rainfall, but because so few people live in those areas, there is sufficient water to meet their needs, and thus no water scarcity. Central Australia is an example of an area that receives very little rainfall but generally has sufficient water resources to meet the needs of its sparsely distributed population. There are two forms of water scarcity, physical water scarcity and economic water scarcity. Physical water scarcity occurs when the natural water resources in an area cannot meet the needs of the people living there. 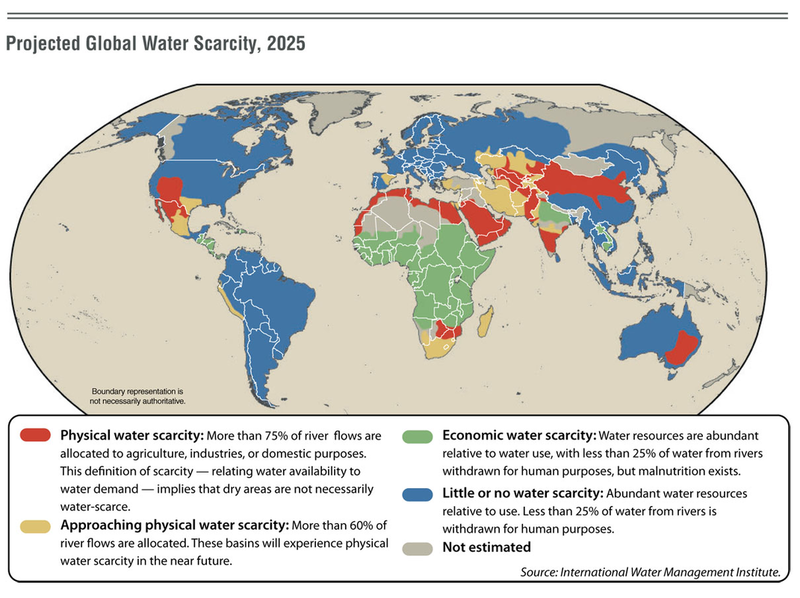 Physical water scarcity occurs particularly in sparsely populated arid and semi-arid areas such as north-west China, central Asia, parts of Australia, south-west United States and northern Africa. Economic water scarcity arises when poor management of the water resources in an area, such as under-investment in water storage and distribution systems, causes the demand for water to exceed the amount available. Economic water scarcity occurs especially in low-income countries where governments lack the funds to invest in infrastructure, such as sub-Saharan Africa, northern India and parts of Indochina (Laos, Cambodia and Vietnam). Codrington, Stephen. Our Changing Planet (Planet Geography Book 1) (Kindle Locations 8736-8756). Solid Star Press. Kindle Edition. 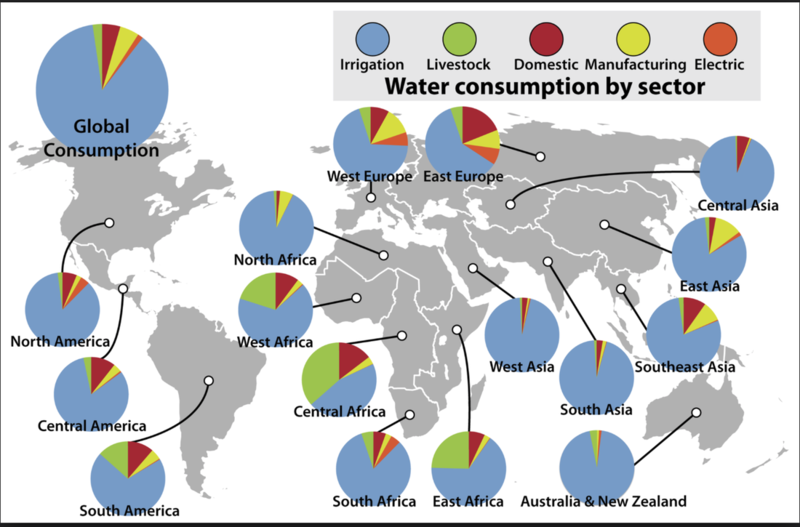 Why is the uneven distribution of water resources around the world a problem? How does population growth exacerbate the problem of the uneven distribution of the world’s water resources? ​Describe (a) the amount of water available to humans as an accessible resource, and (b) the amount of water that humans consume each year. 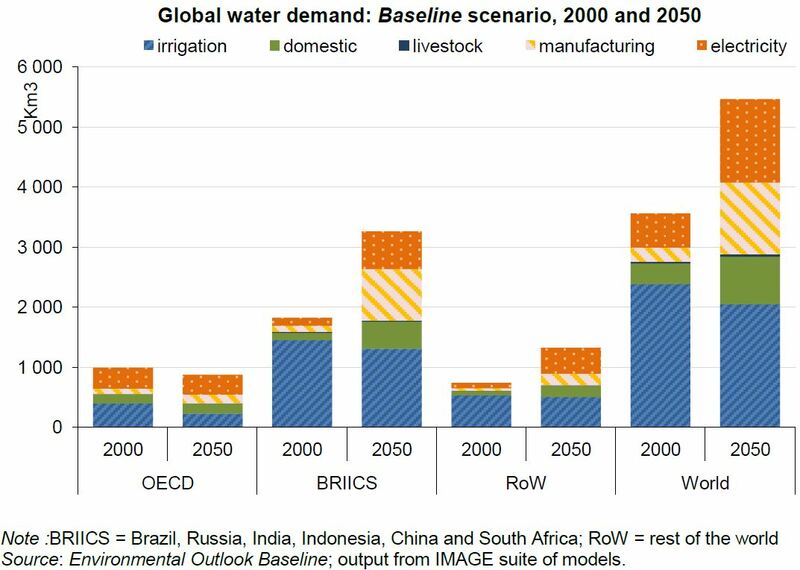 Describe and account for the changing trends in (a) the quantity of water used globally, and (b) the changing ways in which water is used. What is meant by the term ‘embedded water’? ​What is the difference between green water, blue water, grey water and black water? 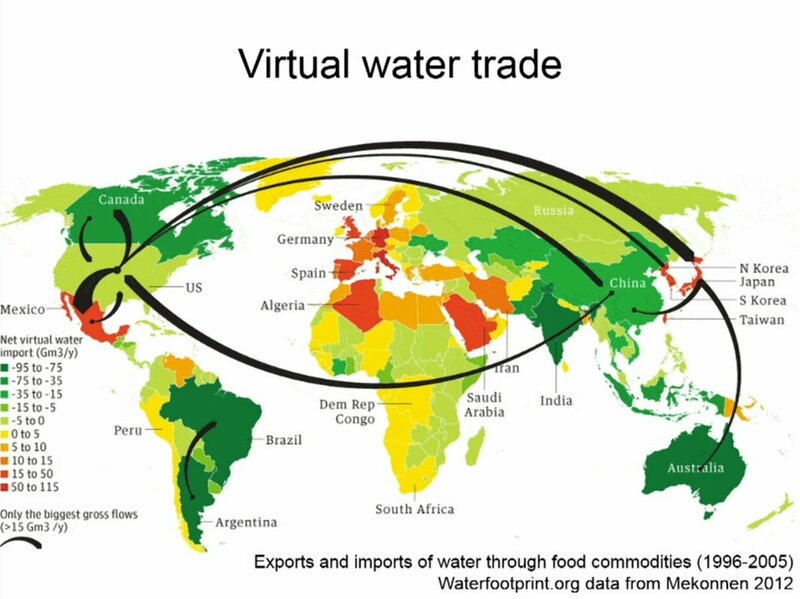 Explain why importing a product that contains large quantities of embedded water from a drought-prone country is considered as exporting drought. How is ‘water scarcity’ different from aridity, or low rainfall? What is the difference between physical water scarcity and economic water scarcity? 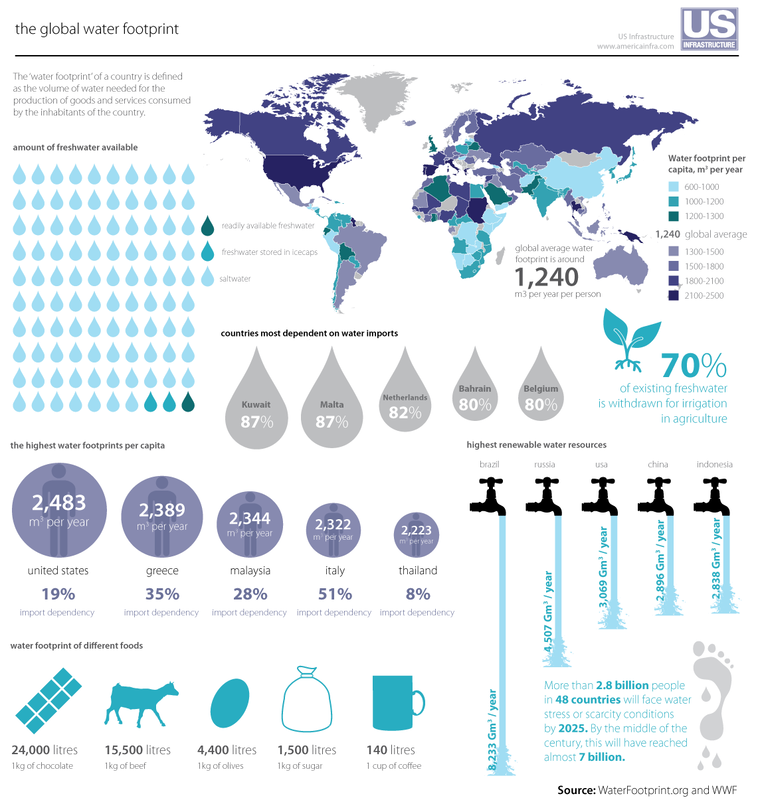 Describe the distribution of global water scarcity. The graphic above details the breakdown of global land allocation and use based on areal extent. 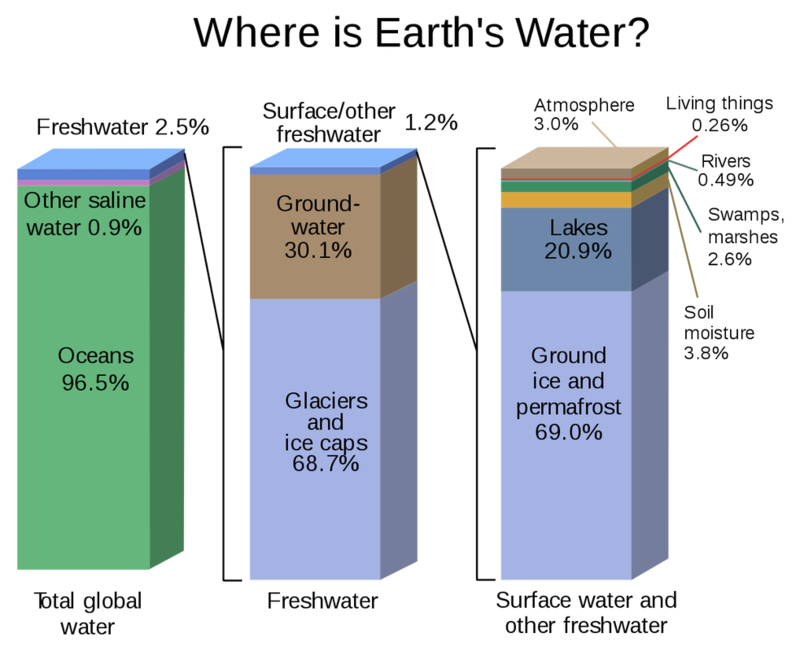 Only 71 percent of Earth's land surface is defined as habitable; the remaining 29 percent comprises of glaciers and barren land. Here, 'barren land' refers to land cover in which less than one-third of the area has vegetation or other cover; barren land typically has thin soil, sand or rocks and includes deserts, dry salt flats, beaches, sand dunes, and exposed rocks. Humans use half of global habitable area for agricultural production (of the remainder, 37 percent is forested; 11 percent as shrubbery; and only one-percent is utilised as urban infrastructure). More than three-quarters of our agricultural land is used for the rearing of livestock through a combination of grazing land and land used for animal feed production. Despite being dominant in land allocation for agriculture, meat and dairy products supply only 17 percent of global caloric supply and only 33 percent of global protein supply. 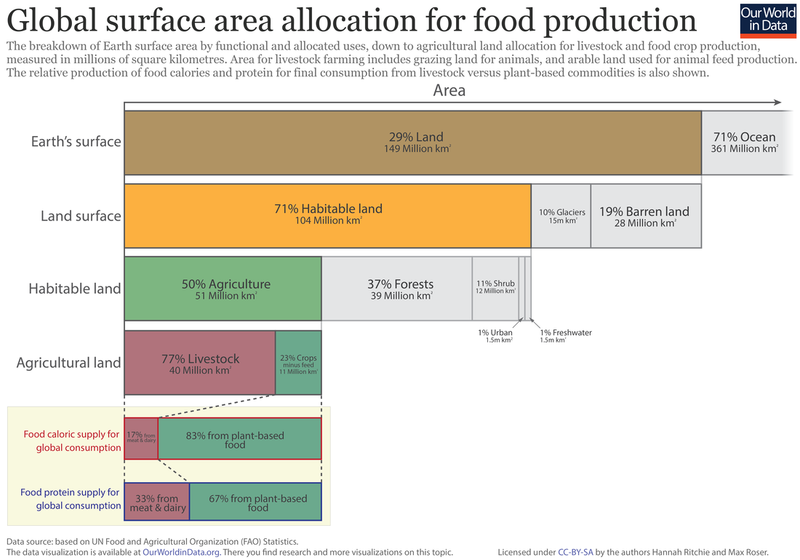 In other words, the 11 million square kilometres used for crops supply more calories and protein for the global population than the almost 4-times larger area used for livestock. Technological changes have increased the level of mechanisation on farms in most parts of the world. Machinery provides farmers with the means to perform tasks such as ploughing and harvesting much more quickly. Purchased inputs such as pesticides and chemical fertilisers have become more commonplace on farms around the world, and these increase yields by removing competitor plant and insect species while boosting the nutrient base for the growing plants. Farm sizes have been growing in most parts of the world as consolidation of smaller properties occurs. Larger farms allow greater use of machinery and enable economies of scale to be achieved. Increasing commercialisation of farms, and a commensurate decline in subsistence farming, provides farmers with a financial incentive to increase production in an efficient manner. Improved spatial integration through the construction of roads and railways enables farmers to transport their produce cheaply to more markets, increasing sales and profits. Codrington, Stephen. Our Changing Planet (Planet Geography Book 1) (Kindle Locations 8906-8920). Solid Star Press. Kindle Edition. Rising incomes give people access to energy dense foods that were previously unaffordable. Western diets are seen as being more modern and fashionable, and thus eating meat and fast foods become aspirations for upwardly mobile people. s economic development occurs in middle-income countries, trade links develop and a greater range of Western and other foreign foods becomes available. Rising farm productivity makes some foods more affordable, widening access to a growing middle class. Codrington, Stephen. Our Changing Planet (Planet Geography Book 1) (Kindle Locations 8980-8993). Solid Star Press. Kindle Edition. Describe the world's land usage. How has agricultural land use changed - refer to countries and examples. Why has there been an increase in agricultural productivity? production and prices. Explain why this is so. some parts of the world than others. pressure on world food supplies and agricultural resources? How has food consumption changed - refer to data and types of food. What reasons are there for global diet homogenization? ​Non-renewable energy comes from sources that will run out or will not be replenished in our lifetimes—or even in many, many lifetimes. 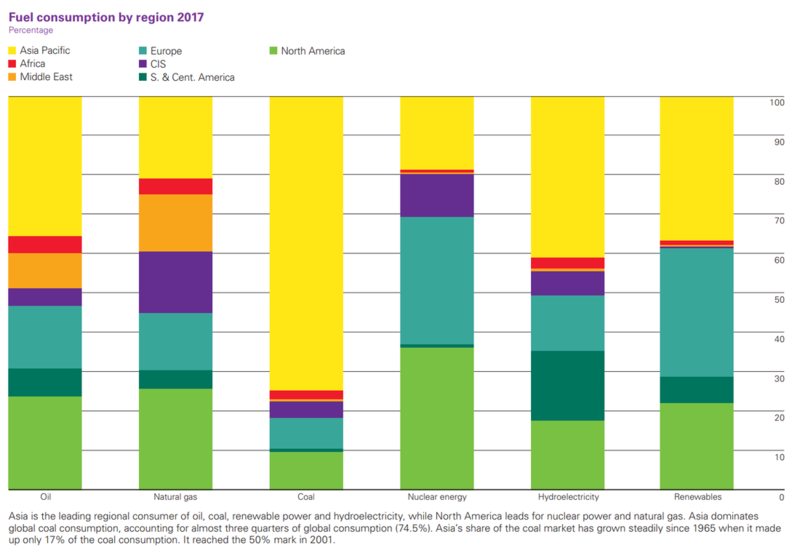 Most non-renewable energy sources are fossil fuels: coal, petroleum, and natural gas. Carbon is the main element in fossil fuels. For this reason, the time period that fossil fuels formed (about 360-300 million years ago) is called the Carboniferous Period. All fossil fuels formed in a similar way. Hundreds of millions of years ago, even before the dinosaurs, Earth had a different landscape. It was covered with wide, shallow seas and swampy forests. Plants, algae, and plankton grew in these ancient wetlands. They absorbed sunlight and created energy through photosynthesis. When they died, the organisms drifted to the bottom of the sea or lake. There was energy stored in the plants and animals when they died. Over time, the dead plants were crushed under the seabed. Rocks and other sediment piled on top of them, creating high heat and pressure underground. In this environment, the plant and animal remains eventually turned into fossil fuels (coal, natural gas, and petroleum). Today, there are huge underground pockets (called reservoirs) of these non-renewable sources of energy all over the world. Fossil fuels are a valuable source of energy. They are relatively inexpensive to extract. They can also be stored, piped, or shipped anywhere in the world. However, burning fossil fuels is harmful for the environment. When coal and oil are burned, they release particles that can pollute the air, water, and land. Some of these particles are caught and set aside, but many of them are released into the air. Burning fossil fuels also upsets Earth’s “carbon budget,” which balances the carbon in the ocean, earth, and air. When fossil fuels are combusted (heated), they release carbon dioxide into the atmosphere. Carbon dioxide is a gas that keeps heat in Earth’s atmosphere, a process called the “greenhouse effect.” The greenhouse effect is necessary to life on Earth, but relies on a balanced carbon budget. The carbon in fossil fuels has been sequestered, or stored, underground for millions of years. By removing this sequestered carbon from the earth and releasing it into the atmosphere, Earth’s carbon budget is out of balance. This contributes to temperatures rising faster than organisms can adapt. Coal is a black or brownish rock. We burn coal to create energy. Coal is ranked depending on how much “carbonization” it has gone through. Carbonization is the process that ancient organisms undergo to become coal. About 3 meters (10 feet) of solid vegetation crushed together into .3 meter (1 foot) of coal! Peat is the lowest rank of coal. It has gone through the least amount of carbonization. It is an important fuel in areas of the world including Scotland, Ireland, and Finland. Anthracite is the highest rank of coal. Anthracite forms in regions of the world where there have been giant movements of the earth, such as the formation of mountain ranges. The Appalachian Mountains, in the eastern part of the United States, are rich in anthracite. We mine coal out of the ground so we can burn it for energy. There are two ways that we can mine coal: underground mining and surface mining. Underground mining is used when the coal is located below the surface of the Earth, sometimes 300 meters (1,000 feet) deep—that’s deeper than most of the Great Lakes! Miners take an elevator down a mineshaft. They operate heavy machinery that cuts the coal out of the Earth and brings it above ground. This can be dangerous work because cutting coal can release dangerous gases. The gases can cause explosions or make it hard for miners to breathe. Surface mining is used when the coal is located very near the surface of the earth. To get to the coal, companies must first clear the area. They take away the trees and soil. The coal can then be cut out of the ground more easily. Entire habitats are destroyed during this process. About half the electricity in the United States comes from coal. It gives power to our lights, refrigerators, dishwashers, and most other things we plug in. When coal is burned, it leaves “byproducts” that are also valuable. We use the byproducts to make cement, plastics, roads, and many other things. Coal is a reliable source of energy. We can rely on it day and night, summer and winter, sunshine or rain, to provide fuel and electricity. Using coal is also harmful. Mining is one of the most dangerous jobs in the world. Coal miners are exposed to toxic dust and face the dangers of cave-ins and explosions at work. When coal is burned, it releases many toxic gases and pollutants into the atmosphere. Mining for coal can also cause the ground to cave in and create underground fires that burn for decades at a time. Petroleum is a liquid fossil fuel. It is also called oil or crude oil. Petroleum is trapped by underground rock formations. In some places, oil bubbles right out of the ground. At the LaBrea Tar Pits, in Los Angeles, California, big pools of thick oil bubble up through the ground. Remains of animals that got trapped there thousands of years ago are still preserved in the tar! Most of the world’s oil is still deep under the ground. We drill through the earth to access the oil. Some deposits are on land, and others are under the ocean floor. Once oil companies begin drilling with a “drill rig,” they can extract petroleum 24 hours a day, seven days a week, 365 days a year. Many successful oil sites produce oil for about 30 years. Sometimes they can produce oil for much longer. When oil is under the ocean floor, companies drill offshore. They must build an oil platform. Oil platforms are some of the biggest manmade structures in the world! There are advantages to drilling for oil. It is relatively inexpensive to extract. It is also a reliable and dependable source of energy and money for the local community. Oil provides us with thousands of conveniences. In the form of gasoline, it is a portable source of energy that gives us the power to drive places. Petroleum is also an ingredient in many items that we depend on. However, burning gasoline is harmful to the environment. It releases hazardous gases and fumes into the air that we breathe. There is also the possibility of an oil spill. If there is a problem with the drilling machinery, the oil can explode out of the well and spill into the ocean or surrounding land. Oil spills are environmental disasters, especially offshore spills. Oil floats on water, so it can look like food to fish and ruin birds’ feathers. Natural gas is another fossil fuel that is trapped underground in reservoirs. It is mostly made up of methane. You may have smelled methane before. The decomposing material in landfills also release methane, which smells like rotten eggs. There is so much natural gas underground that it is measured in million, billion, or trillion cubic meters. Natural gas is found in deposits a few hundred meters underground. In order to get natural gas out of the ground, companies drill straight down. However, natural gas does not form in big open pockets. Natural gas is trapped in rock formations that can stretch for kilometers. To reach natural gas, some companies use a process called “hydraulic fracturing,” or fracking. Hydraulic means they use water, and fracturing means to “split apart.” The process uses high-pressure water to split apart the rocks underground. This releases the natural gas that is trapped in rock formations. If the rock is too hard, they can send acid down the well to dissolve the rock. They can also use tiny grains of glass or sand to prop open the rock and let the gas escape. We use natural gas for heating and cooking. Natural gas can also be burned to generate electricity. We rely on natural gas to give power to lights, televisions, air conditioners, and kitchen appliances in our homes. Natural gas can also be turned into a liquid form, called liquid natural gas (LNG). LNG is much cleaner than any other fossil fuels. Liquid natural gas takes up much less space than the gaseous form. The amount of natural gas that would fit into a big beach ball would fit into a ping-pong ball as a liquid! LNG can be easily stored and used for different purposes. LNG can even be a replacement for gasoline. Natural gas is relatively inexpensive to extract, and is a “cleaner” fossil fuel than oil or coal. When natural gas is burned, it only releases carbon dioxide and water vapor (which are the exact same gases that we breathe out when we exhale!) This is healthier than burning coal. However, extracting natural gas can cause environmental problems. Fracturing rocks can cause mini-earthquakes. The high-pressure water and chemicals that are forced underground can also leak to other sources of water. The water sources, used for drinking or bathing, can become contaminated and unsafe. Fossil fuels are the leading non-renewable energy sources around the world. There are others, however. Nuclear energy is usually considered another non-renewable energy source. Although nuclear energy itself is a renewable energy source, the material used in nuclear power plants is not. Nuclear energy harvests the powerful energy in the nucleus, or core, of an atom. Nuclear energy is released through nuclear fission, the process where the nucleus of an atom splits. Nuclear power plants are complex machines that can control nuclear fission to produce electricity. The material most often used in nuclear power plants is the element uranium. Although uranium is found in rocks all over the world, nuclear power plants usually use a very rare type of uranium, U-235. Uranium is a non-renewable resource. Nuclear energy is a popular way of generating electricity around the world. Nuclear power plants do not pollute the air or emit greenhouse gases. They can be built in rural or urban areas, and do not destroy the environment around them. However, nuclear energy is difficult to harvest. Nuclear power plants are very complicated to build and run. Many communities do not have the scientists and engineers to develop a safe and reliable nuclear energy program. Nuclear energy also produces radioactive material. Radioactive waste can be extremely toxic, causing burns and increasing the risk for cancers, blood diseases, and bone decay among people who are exposed to it. Describe the changes in the types of energy resources used since 1800. Describe the differences in the types of energy used in different parts of the world. What is meant by ‘peak oil’? Outline current thinking on the timing of peak oil. Why do fossil fuels dominate the world energy production? What is the ‘reserves-to-production ratio’ when referring to oil production? And describe the trends for the reserves-to-production ratio between for (a) the world, (b) the Middle East, and (c) North America. Why do high oil prices encourage research into alternative sources of energy? Describe the benefits and problems of nuclear power. What is meant by the term ‘renewable energy’? List some significant examples of types of renewable energy. Outline the benefits and shortcomings of (a) hydroelectricity, (b) geothermal power. Discussion & notes on: Are alternative energies a realistic alternative?